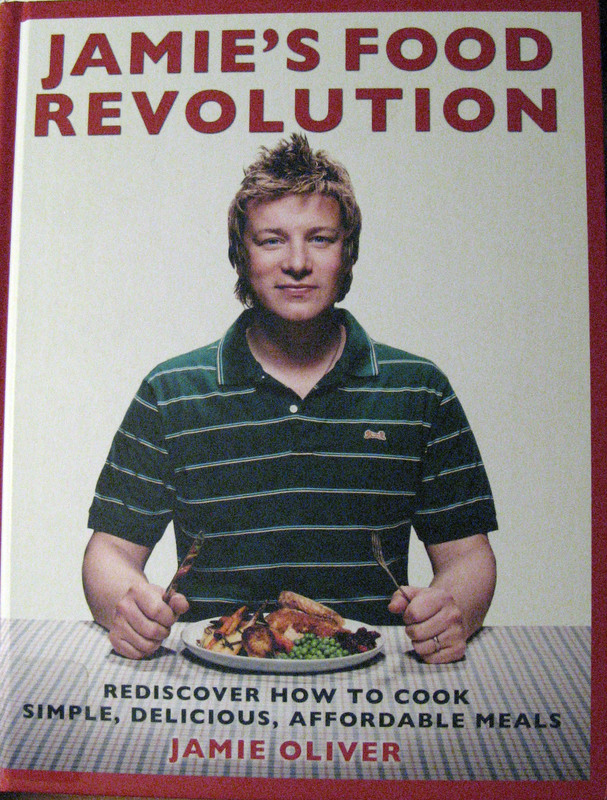 I am so excited about Jamie Oliver's latest book Jamie's Food Revolution. Not only do I like the fact that in this book Jamie wants to help people learn to cook good meals for themselves, but I feel this cookbook has more practical recipes that I would actually make than any of his other books. Jamie Oliver is a food legend in the UK who has written nine cookbooks now and hosted numerous cooking series on television. His newest television series "Jamie Oliver's Food Revolution", filmed here in America, is set to debut this Friday on ABC. The premise of this latest cookbook and the new television series is basically the same: learn to cook fresh, delicious, and balanced meals and thereby revolutionize your life and health. This cookbooks is broken down into 14 chapters which include: Twenty-Minute Meals, Quick Pasta, Tasty Stir-Fries, Easy Curries, Lovin' Salads, Simple Soups, Homely Ground Beef, Comforting Stews, Family Roast Dinners, Delish Veggies, Classic Fish, Kick-Start Breakfasts, and Sweet Things. As always, Jamie's cookbook is filled with mouth-watering pictures and easy-to-read recipes. Here are some of the recipes I want to try: Chicken and Leek Stroganoff, Asian Chicken Noodle Broth, Chicken Korma, Evolution Cucumber Salad, Meatballs and Pasta, Basic Stew with Four Variations, Broccoli with Asian Dressing, Braised Bacon Cabbage, Kedgeree, and Fruit Scones. 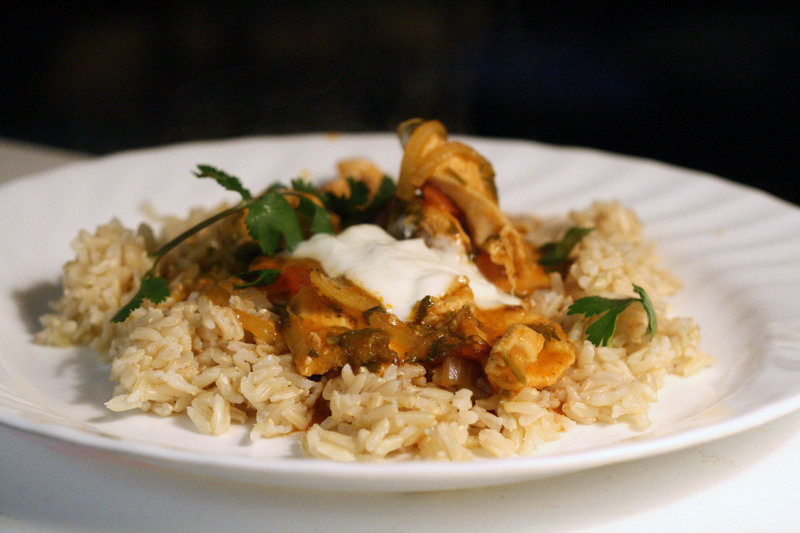 I chose to try Jamie's Chicken Tikka Masala which came out full of flavor and very delicious. My children even voted this a good meal! I couldn't find tikka masala paste anywhere, so I had to make Jamie's own, which I was glad I did -- it wasn't as complicated as it sounded and the taste was terrific. Slice the chicken breasts lengthways into 3/4-inch-thick strips. Peel, halve, and finely slice the onions. Finely slice your chile. Peel and finely slice the ginger. Pick the cilantro leaves and put to one side, then finely chop the stalks. Put a large casserole-type pan on a medium to high heat and add a couple of lugs of oil and the butter. Add the onions, chile, ginger, and cilantro stalks and cook for 10 minutes, until softened and golden. Add the curry paste and the strips of chicken. Stir well to coat everything with the paste and season with salt and pepper. Add the tomatoes and coconut milk. Fill one of the empty cans with water, pour into the pan, and stir again. Bring to a boil, then turn the heat down and simmer for 20 minutes with the lid on. 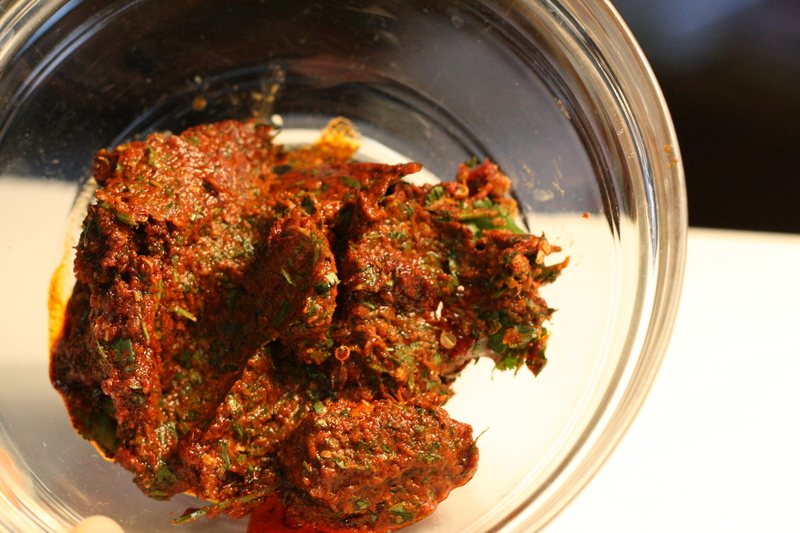 Check the curry regularly to make sure it's not drying out and add extra water if necessary. When the meat is tender and cooked, taste and add a bit more salt and pepper -- please season carefully. This will be fantastic served with rice and a few spoonfuls of yogurt dolloped on top. Sprinkle over the almonds and cilantro leaves and serve with some lemon wedges for squeezing over. And a little lemon-dressed green salad would round it off. First peel the garlic and ginger. Put a frying pan on a medium to high heat and add the spices for toasting to the dry pan. Lightly toast them for a few minutes until golden brown and smelling delicious, then remove the pan from the heat. Add the toasted spices to a pestle and mortar and grind until fine, or put them into a food processor and whiz to a powder. Either way, when you've ground them whiz the toasted spices in a food processor with the rest of the ingredients until you have a smooth paste. I watched the preview for the show on Sunday, can't wait to watch more on Friday! i love chicken tikka masala! i'll have to try this out sometime. Thanks for sharing! I will have to check out that cookbook. Was this a real spicy dish?